Believe it or not, people are judging you every day by your grammar skills—or a lack thereof. A letter, email, or document from your firm may be the first (and only) impression that a client, opposing counsel, judge, or prospective client gets of you, your lawyer, and your firm. An attorney may have created an absolutely fabulous piece of work, but if it leaves your office with a dumb mistake that would have been caught if someone had taken the time to proofread it, that fabulous piece of work turns into a piece of something else and leaves the client wondering if what he is paying for is correct. It also reflects poorly on the attorney AND on everyone else who works there, regardless of whether they have actually touched the document. There comes a time when a client tires of sloppy work product. Imagine that you are your firm’s best client—paying $600 (more or less) an hour—and receive work product with misspellings and grammatically incorrect sentences. How long would it take you to find another law firm with more pride in their work? You also have to think about your firm’s national (or global) reputation. Ask yourself how many times someone in your office has received an email with an attached document containing an inadvertent (although funny) typo that ended up forwarded to a “joke” email group or pinned on the bulletin board in your firm’s kitchen. Just think, with social networking that type of mistake could end up on the Internet for millions to “enjoy” and pass on—all at the expense of your firm’s reputation. All of this really does happen, and I don’t want my office’s work product to end up with a big red circle around it on some other firm’s bulletin board or passed on to law firms across the country—particularly when so many of my NALS friends recognize the name of my firm. It reflects poorly on me and everyone who works here. Print and read the hard copy. Read out loud (preferably in a room with a closed door) and silently to yourself. Read backwards to focus on the spelling of words. Have others read for you. Use a blank sheet of paper to cover up the material not yet proofed. 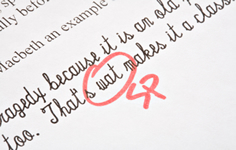 Keep a list of the most common errors you (or the authors you are proofing for) make. If your attorney makes the same mistakes over and over again (mine consistently uses “meet” for “met” and “choose” for “chose”), keep that list so you can look for those specific errors. If you are editing in Word, use the “track changes” function to make your comments apparent to other reviewers. You should not just make edits you think should be made (except perhaps for formatting changes). Something you think is wrong may change the intent or meaning of the entire document and the attorney is VERY unlikely to read it again once they have given it to you. If you redline the document and send it back, they can check on the specific “suggested changes” and either accept or reject them before it goes to the client or opposing counsel. Use some type of editor’s flags. Put a symbol (such as “#” or anything you will use consistently) into the document where the author needs to pay special attention or next to items that need to be double-checked before it is finalized. In the final proof, search for all “#” flags and remove them. I use brackets and all caps messages that are highlighted. On the final look through the document on the screen, those are fairly easy to see. Use whatever method will work for you; just make sure that they are removed before they are finalized. If you are proofreading technical information, enlist a buddy and take turns reading the document out loud to each other. While one of you reads, the other one follows along on a separate copy to catch any errors and awkward phrases. First, proof the body of the text and then go back and proof the headings. Headings are prone to error because the person drafting the document often comes up with the heading for a section and then either ends up writing something completely different or someone else edits that language so the heading does not fit the content. Authors tend to overlook headings when they are reviewing documents. Be careful that you actually read what the document says and not just what you think it says or you can miss subtle errors in words that might be spelled correctly but just are not the correct word. Double check proper names. Nothing will upset a client more than seeing his own name misspelled. Check citations to other documents. Go to the other document to make sure the quotations and paragraph, section, and page numbers are accurate. If a judge figures out that one quotation is misstated, he may not trust any other quotation you use. With increased reliance on email, it is even easier to send mistakes to your client, opposing counsel, and others. We are all busy, but this is how your client sees the value of the amount of money he is paying your firm. Take time to slow down and proofread EVERYTHING—including emails. Remember, everything that leaves your office is worth the investment of your time. Errors in our firms’ work product are very avoidable, even when we are stressed and rushing, if we will make proofreading a habit. © 2013 NALS. This article was originally posted on the NALS website.